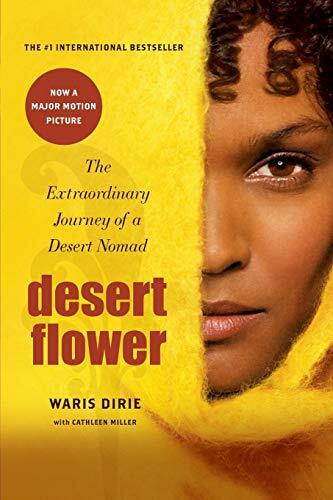 Desert Flower is the autobiography of Waris Dirie, a fashion model and human rights activist. Waris was raised in a nomadic Somali family. Until the approximate age of 13, she slept out under the stars every night, had never used a toilet, and subsisted mainly on camel's milk. When confronted with marrying a 60-year old man, she fled her home, leaving behind her beloved mother and siblings, and walked across hundreds of miles of desert to a new life. The story follows her through her time in Mogadishu, living in London as a maid for the Somali ambassador, and her discovery and catapult into the world of modelling. I was really disappointed with this book, but it was very interesting to read it with the story of Aman so fresh in my mind. There are numerous discrepancies between both books, with each claiming certain traditions/lifestyles as the "Somali way of life". Yet, unlike Aman, Waris makes very little acknowledgement of separate ways of life in Somalia between city/bush and different tribes and minority groups. There are also some gaps in her story that seem to have been left out. Another of my gripes? The language. Now, I am a VERY liberal person, and also the first to admit I can spew some unwarranted obscenities when angry. But the foul language in this book felt very artificial and vulgar to me. It completely detracted from the story. A small redemption? The breath that brings this book to life is the descriptions of how FGM has affected Waris' life, and her shift in becoming a strong and passionate advocate for women's rights in both Africa and Muslim cultures. While I unwrapped and devoured my candy, I examined the white people around me. They looked cold and sickly to me. "You need sun," I would have said to them if I had known English; I assumed this problem was a temporary condition. They couldn't always look like that, could they? These people must have turned white because they'd been out of the sun too long. I ran and touched the ground and rubbed the earth between my fingers. I touched the trees. They were dusty and dry, but I knew it was time for the rains soon, then everything would blossom. I sucked the air into my lungs. It held the scents of my childhood memories, all those years when I lived outside and these desert plants and this red sand were my home. Oh, God, this was my place.